The freshman Democrat took in over $832,000, largely from online donors, after facing criticism for using anti-Semitic tropes this winter. Small-dollar donors rushed to defend embattled Rep. Ilhan Omar (D-Minn.) in the first three months this year, as she faced charges of anti-Semitism from prominent Democrats, according to a fundraising report filed Monday with the Federal Election Commission. 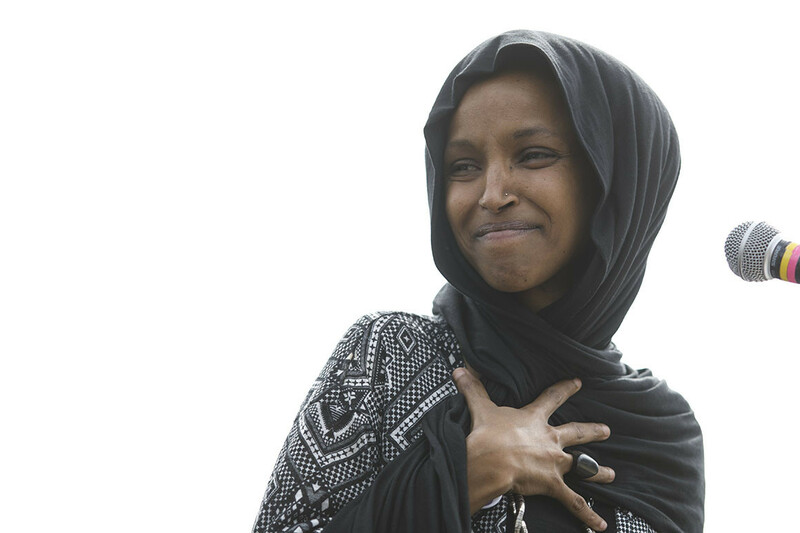 Omar, a Minnesota Democrat elected in 2018 and sworn in for the first time in early January, found herself embroiled in controversy shortly after arriving in Washington. The first Somali-American member of Congress was widely rebuked in February, including by her own party, after several high-profile instances in which she invoked anti-Semitic tropes about U.S. politicians’ support for Israel. Omar raised $832,000 in the first quarter, according to her FEC report — among the best totals posted by any House Democrat. Roughly half of her donations, $415,000, came from people who gave less than $200 to Omar, and the majority of her funds, $631,000, came from online donors who gave via ActBlue, the Democratic online fundraising platform that has been such a boon to the party’s candidates in recent years that Republicans are scrambling to develop an alternative. As supporters sent money to Omar, frustrations within her own caucus escalated to a point where Speaker Nancy Pelosi and her deputies were forced to intervene with a joint statement condemning Omar’s comments in February — an extremely unusual rebuke by party leaders of a freshman lawmaker. Omar apologized, but was again accused of fueling anti-Semitic stereotypes just weeks later. Now, she has been directly targeted by President Donald Trump on Twitter, which fueled an angry conservative backlash that her allies say has sparked a rise in threats against her life. Omar received just $10,000 from political action committees, including two from other House Democrats: Fellow freshman Rep. Alexandria Ocasio-Cortez (N.Y.) gave Omar $2,000 on March 28, and House Majority Whip Jim Clyburn (S.C.) gave her $1,000 on March 29. Clyburn, the No. 3 House Democrat, came to Omar’s defense earlier this year, after several of their fellow Democrats drafted legislation to formally condemn anti-Semitism, which would have specifically called out Omar by name. The legislation was eventually broadened to condemn all forms of hate speech, to the frustration of some prominent Democrats who wanted to punish Omar. Her $832,000 haul puts her among House Democrats’ top fundraisers in the first quarter, topping nearly every Democratic incumbent running in a vulnerable district, including prolific fundraisers like Rep. Josh Gottheimer (D-N.J.), who raised $830,000 for his reelection campaign inside the expensive New York media market. Freshman Rep. Josh Harder (D-Calif.), who represents a central California swing district, outraised Omar with a $873,000 haul. Omar’s campaign spent $241,000 and had $607,000 in cash on hand as of March 31. Omar represents a safely Democratic, Minneapolis-based district that she won by a 56-point margin. She succeeded now-state Attorney General Keith Ellison in Congress, winning the Democratic nomination in a six-candidate primary with 48 percent of the vote. In just her first few months in Congress, Omar has become a fixture of GOP attack ads against Democrats, which have focused on charges of anti-Semitism and other harsh rhetoric. In the last week, the Minnesota Democrat has been a direct target of rhetorical attacks by President Donald Trump and other Republicans accusing her of downplaying the Sept. 11, 2001 terrorist attacks. She and her allies say their comments — which Republicans say were taken out of context — have prompted a number of death threats against her. Democratic presidential candidates rose to her defense, and House Speaker Nancy Pelosi (Calif.) said this week that the U.S. Capitol Police and House sergeant-at-arms are working to “safeguard” Omar, her family and her staff.” But the new campaign finance report only covers activity through the end of March. Omar’s district — which sweeps across downtown Minneapolis — is heavily Democratic. Some party leaders, however, have been eyeing ways to challenge her in 2020, with hopes to recruit a candidate to run against her in the primary.